A patterned wallpaper you might not use in a larger room is perfect for a powder room. The powder room — you know, that little half-bath your guests use? — is one of our favorite rooms to work with at Style on a Shoestring. 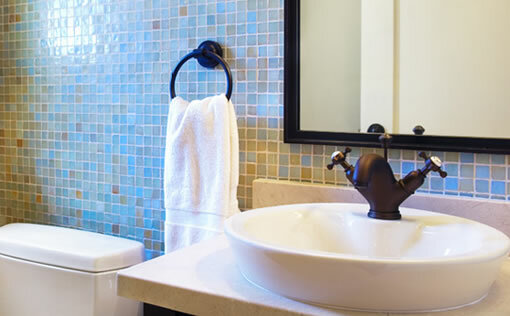 That might surprise you, but those little bathrooms are really fun to redecorate or remodel simply because they are small. And since they are usually somewhat separate from the other areas of a house, powder rooms can even take on a little different look from the rest of your home. Let’s dive into some small powder room design ideas. We almost always use wallpaper in a powder room. If wallpaper makes you think of your mom’s shiny, wild walls in the ’70s and ’80s, you haven’t seen the updated looks in wallpapers. If wallpaper isn’t right for a client, we also like to use wainscoting on the bottom half of the wall and perhaps paint the top half a distinctive color. A small chandelier in a powder room can be an unexpected yet elegant functional accessory. The mirror is another place where you can show some flair, such as a vintage look or perhaps something with a seashell theme if you have a coastal-style home. Tiling the entire wall behind the mirror also adds some color and texture. Sinks and fixtures come in all sizes and shapes, of course, and the powder room is a good place to experiment with them. A vessel sink with a contemporary faucet flowing from the wall can look creative, or a furniture-like vanity can be the room’s centerpiece. 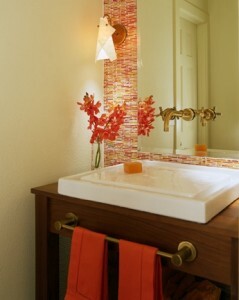 Colorful tiles add texture and interest to a powder room wall. Accessories can be as basic or outlandish as you like. But since the powder bath typically has limited surface space, remember to leave a spot for your guests to place their purses or jackets when they use it. An artistic towel stand, eye-catching tissue box or imaginative soap pump might be just the item to give the room punch. 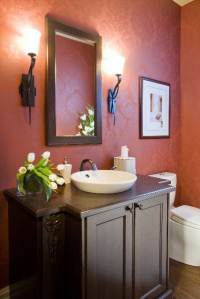 The best way to approach a powder bath redesign is to bring in a color or style from a nearby room and expand on it. For example, my living room has a small amount of teal and orange in it, so I can pull from that palette for my powder room and go a little wild with bright colors I might not use in such excess elsewhere in the house. One of the best things about working with a powder bath is because the room is small, you don’t have to worry about going way over budget. Wallpapering a dining room or living room might run $1500, for example, while wallpapering a powder bath would be less than half that. A full chandelier could cost hundreds of dollars but a small chandelier is much more affordable. 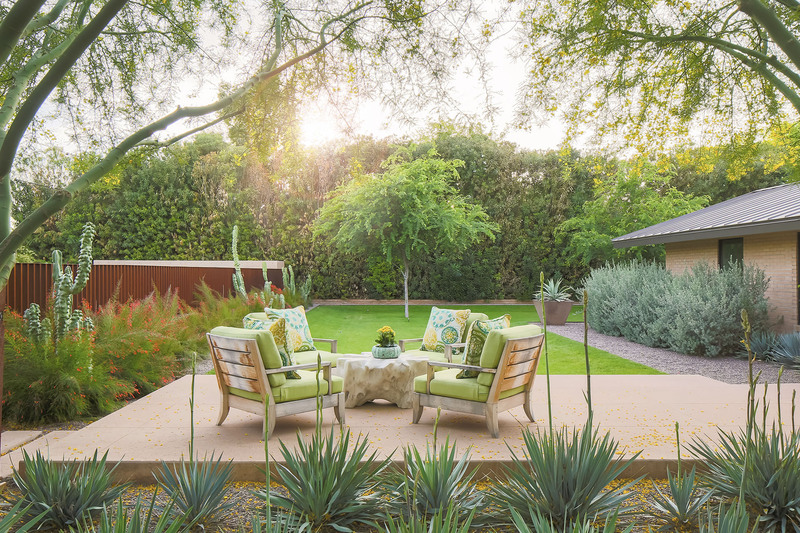 Incorporate bright accent colors from nearby rooms in the design. Almost everyone who visits your home also visits your powder bath at some point. So don’t be afraid to take a few chances and spread your designing wings a bit, but also make it friendly and hospitable. If we can help redesign or remodel your powder bath, please contact our San Diego interior designers at Tracy Lynn Studio.